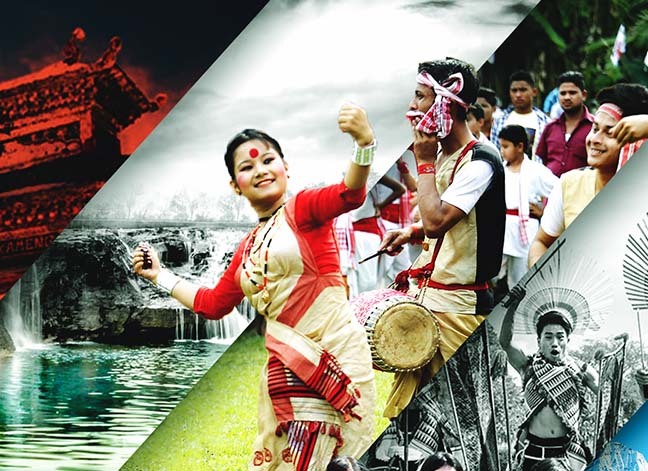 Northeast India boasts of a one of its kind heritage. The endless beauties and the rich culture can attract any people to this beautiful land. The undulated hills and valleys, the virgin forests, the cascading waterfalls, the crystal clear rivers, the lush green tea gardens, the mystic nature, the myths and legends, the wildlife, varied flora and fauna, the people – their culture, traditions, heritage, food habits and celebrations of life make the Northeast India a treasure trove for the explorers. Northeast India comprises of eight states – Assam, Arunachal Pradesh, Meghalaya, Manipur, Mizoram, Nagaland, Sikkim and Tripura. The region has 65 million people, and about 400 ethnic groups. The ethnic diversity includes Austro-Asiatic speakers from Southeast Asia, Tibeto-Burmese from China and Indo-Aryans from the Gangetic Plains. Nowhere in the world has a geographical area equivalent to the Northeast India which consists of such a varied group of people. The region has highest density of different tribes and several sub-tribes residing in an area, making the region vibrant with colourful people. Each tribe has its own language, culture, traditions, heritage, way of life and dressing. The traditional attire worn by the women of Northeast India are vibrant and unique, and have a charm of their own. The eight states of the region have their own unique dresses that are a reflection of the tribal culture, with exclusive patterns and vivacious colours. Geography and climate of the Northeast India is tectonically and morphologically part of East Asia, while politically it is part of South Asia. The region is connected with the Indian mainland with a 22 km-wide landmass called the Siliguri Corridor. Northeast India shares 98 percent of its borders with five countries – China, Nepal, Bhutan, Myanmar and Bangladesh. Kangchenjunga is the third highest mountain in the world, and lies partly in Sikkim. It is at an elevation of 8,586 m (28,169 ft), the second highest mountain of the Himalayas, and the highest in India. It is called Five Treasures of Snow after its five high peaks, and has always been worshipped by the people of Darjeeling and Sikkim. In general, the beautiful mountains and highlands in Northeast India are extension of the Minor Himalayan ranges, and runs south as the Arakan Yoma in Myanmar. The earliest settlers in the Northeast India are believed to be the Austro-Asiatic speakers from Southeast Asia, followed by Tibeto-Burmese from China and by 500 B C Indo-Aryans speakers from the Gangetic Plains. People residing in the region are varied, diverse and lead different lifestyles. The divergence in the culture is so much that it varies from one village to the other. They practice different customs, traditions and beliefs – but one thing binds the people of the Northeast India with one thread — simplicity. One is sure to be mesmerized by the warmth and hospitality, irrespective of social standing in Northeast India. People of mainland India can always take lessons on the art of welcoming guests from northeast. This is unique and unparallel. What stands out is the life of women in Northeast India. It is much better than the rest of the country. They are financially independent and take their own decisions. They work side by side with men ranging from street vendors, labourers to teachers and managers to engineers. While gender equality is universal in the region, the state of Meghalaya is unique for its matrilineal system. When social reformers are struggling to eradicate caste-ism as a social evil even after 71 years of India’s independence, Northeast India is the only region which does not differentiate its people on the basis of caste, creed or religion. The social standing of northeast India is high in absence of a rigid caste system and evil practices like dowry. Three prominent tribes of Meghalaya — Garo, Jaintia and Khasi follow a unique matrilineal system. After marriage, the groom shifts to the bride’s house and children take mother’s surname or clan name. Khasi and Jaintia are said to be the largest surviving matrilineal culture (s) in the world. Both Khasi and Jaintia are of Mon-Khmer origin. Garos are of Austric-Mongoloid ethnic group, and are also one of the few remaining matrilineal societies in the world. Traditionally, in Khasi, Jaintia and Garo societies, the youngest daughter inherits the property from her mother. Every tribe in the northeast India has a distinctive pattern of dressing. All of them have their own colorful, traditional attire, which are quite different from each other. While the traditional attires are worn mainly by the women of Northeast India, all of those are quite different from saree, salwar kameez and ehenga choli worn by women in the mainland in India. Jewelry in the Northeast is quite different from rest of India. All the tribes have its own highly gorgeous jewelleries, generally made of beads and locally available materials.. Jewellery is also a form of distinguishing each tribe in the northeast. Some tribes create earrings made of bamboo, cane, glass beads, seeds, and reed, while others wear metal coin necklaces and leather waistbands with stones. The Apatani tribe wears iron bracelets made by the blacksmiths. Tribes in northeast celebrate life to the full and they have festivals for almost every occasion. The festivals flaunt the region’s rich culture. Most of the festivals here are either related to harvest and beginning of a New Year. Some of the biggest festivals are – Bihu (in Assam), Hornbill festival (in Nagaland), Cheiraoba festival (in Manipur), Chapchar Kut (in Mizoram), Siang River Festival (Arunachal Pradesh), Saga Dawa (in Sikkim) and Ashokasthami festival (in Tripura). These festivals are a wonderful opportunity for the people belonging to different tribes to bond. Dance is integral part of the life of the tribals of northeast India. The region presents a wide spectrum of dance forms. All the folk dances are accompanied by songs and are supported by distinct traditional musical instruments. Some of the popular dance forms are – Hai Hak (Tripura), Cheraw (Mizoram), Bihu (Assam), Nongkrem dance (Meghalaya), Damphoo Dance (Sikkim), Jagoi (Manipur), Bardo Chham (Arunachal Pradesh) and Changai Dance (Nagaland). Tribes in northeast India are fond of music. Though the indigenous composition is highly rich in quality, it is largely undocumented and unheard in the mainland. With strong western influence of music in the region, the indigenous music, including the aboriginal musical instruments is slowly fading away. Now, various music forms are now confined to indigenous cultural and music festivals. Shillong, is popularly known as the Rock Capital of India. 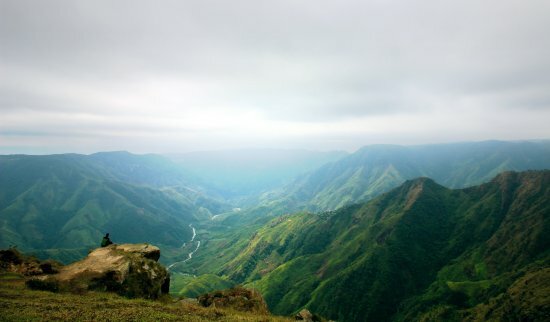 The picturesque hill city of Meghalaya is probably the best destination for music connoisseurs in India. Almost every single person here can sing or play an instrument, and especially the guitar. Whenever the best bands of the world visit India, Shillong is always the venue. The city has also produced some of the finest singers of India, be it the blues, reggae or the rock-n-roll. Some Major Music Festivals hosted here are: Shillong Blues & Jazz Festival and NH7 Weekender. The northeast India states as a whole is the rocking zone of India. Like Shillong, there are several other places in northeast India, which attracts tourists every year because of the rich tradition of music. Organised every year from December 1 to 7, theHornbill International Rock Festivalis always a major attraction. Similarly, theZiro Festivalis again a destination for music lovers. Started in 2012, festival in the beautiful Ziro Valley of Arunachal presents a fantastic quality of independent rock bands. The festival is usually four days long and takes place in late September, and is hosted by the indigenous people of the valley. Food connoisseurs will always find northeast India as the most exciting destination. As northeast India is a melting pot of various tribes and cultures, the flavors of the dishes are unique and mouth watering. Though meat is the primary composition of the dishes, the dishes are light and make you drool forever. Jadoh (Meghalaya), Iromba (Manipur), Vawksa Rep (Mizoram) and Kumurat diya Hanhor Mangxo (Assam) are some of the dishes the tourists should never miss. Northeast India is an explorers’ paradise with some of the most fascinating gifts of nature. One among them is Mechuka, the Forbidden Valley of Arunachal Pradesh. Located about 29 km from the MacMahon Line (that separates India from China), is the breathtakingly beautiful Mechuka Valley. Located at a height of 6,000 feet above sea level, Mechuka has practically remained unexplored. Until recently, the bowl-shaped valley was known only for its airfield – it was one of the crucial strategic locations during the 1962 war with China. It became accessible by road only a few years ago.